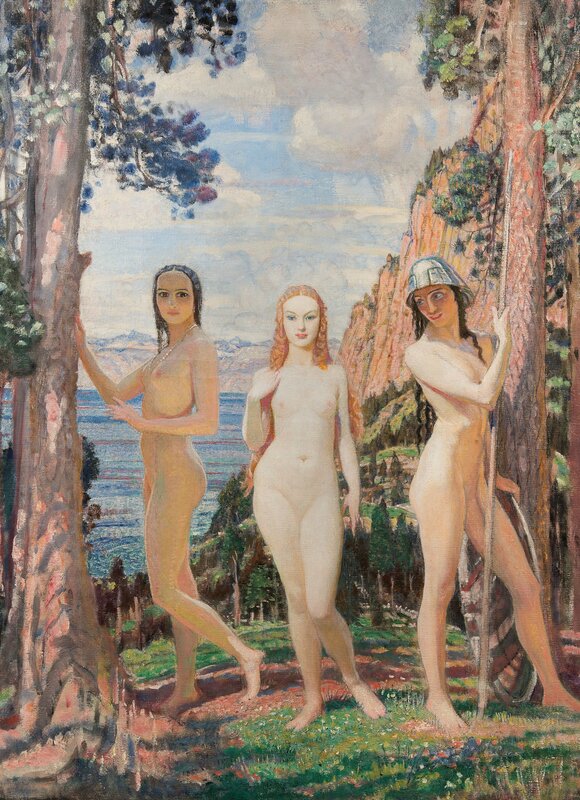 Best known for his portraits and figurative scenes, George Spencer Watson has depicted the moment in Greek mythology when the goddesses Hera, Aphrodite and Athena command the Shepard-Prince Paris to choose the most beautiful of the three divinities. The story of the Judgement of Paris began with the wedding of Peleus and Thetis which all the gods had been invited to attend, except for Eris, goddess of discord. When Eris appeared at the festivities she was turned away and in anger cast a golden apple amongst the assembled goddesses addressed “To the Fairest.” Three goddesses laid claim to the apple–Aphrodite, Hera and Athena. Zeus was asked to mediate and he commanded Hermes to lead the three goddesses to Paris of Troy to decide the issue. The goddesses appeared before him, who each offered him gifts for their favour. He chose Aphrodite, influenced by her promise to present him as a gift Helen, the most beautiful woman in the world, for wife. Helen’s subsequent abduction led directly to the Trojan War and the fall of the city. This work was exhibited at a memorial exhibition held in 1934, a few months after his death, at the Fine Art Society in London. It is a testament to the great quality of this work that it remained in the family when, after the death of the artist, the painting was passed on to his wife, the dancer, Hilda Mary Gardiner, and then by descent to their daughter, Mary Spencer Watson. Mary Spencer Watson was herself a celebrated artist, having trained under Barbara Hepworth’s first husband, John Skeaping. A portrait of her by her father hangs in the Royal Academy in London.